How should we respond to the news of the recent death of another snake-handling Christian? I can tell you a few ways that have been tried: condescension; amusement; disbelief; mockery; advocacy; and rational assessment of the textual place of the snake-handling verses in the Bible. 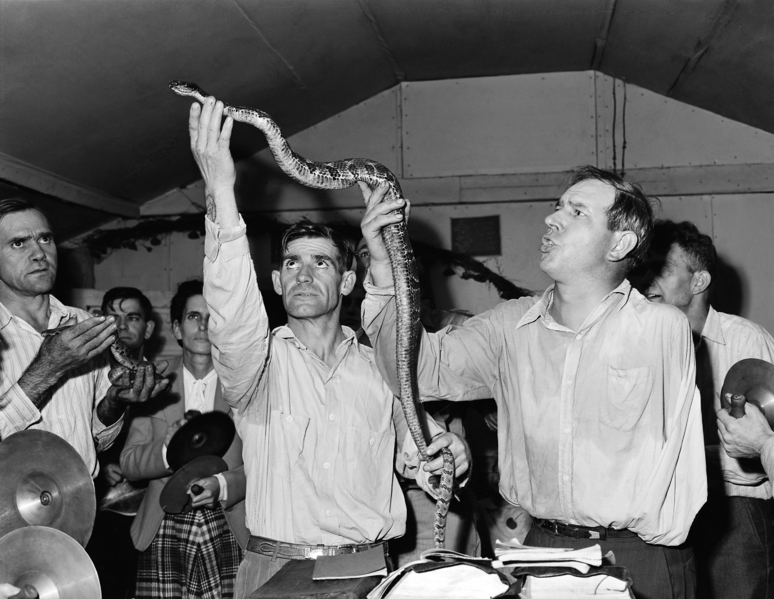 Some who would never engage in the practice admire the deep faith of these snake-handlers, including Professor Ralph Hood of the University of Tennessee – Chattanooga who has documented over 100 deaths from snake bites and the drinking of poison. The Chattanooga Times Free Press has a thorough overview of the practice among some churches in Appalachia. I have not found a response, though, that deals with the relationship of the snake-handlers to their fellow Christians, that is, how are fellow Christians expected to respond to this sort of death and to the very practice of snake-handling? For snake-handling has everything to do with interpretation of the Bible and with faith in the Bible as the literal word of God. I include in my passage verses 15 and 16, often excluded when examining this phenomenon, but central to belief in this practice. Why? Mark 16:15-16 give the impetus for practicing these various signs which are outlined in vv. 17-18. If you believe and are baptized, you are saved, but if you do not believe, you are condemned. What are the signs of those who believe? Casting out demons, speaking in new tongues, picking up snakes, drinking any deadly thing and healing the sick. Many biblical scholars will point out, properly, that Mark in its earliest form ends at Mark 16:8, which excludes these verses. This is true but inconsequential since the canonical form of the Gospel accepted by (most) Christians extends to Mark 16:20, so even though these verses were added at a later point they are considered a part of the accepted word of God, and this is obviously the case for the snake-handlers. Still, we might say to the snake-handlers, regardless that this passage appears in the Bible, why are you paying so much attention to this one passage in Mark? What does it matter? Their answer would certainly be: it’s in the Bible and the Bible is the word of God. It is fair to ask, then, why do you take this passage literally and ignore other passages, such as cutting off your hand if it offends you (Matthew 5:30)? Or why do you not tie a millstone around your neck if you harm a child and jump in the sea (Mark 9:42; Matthew 18:6; Luke 17:2)? Yet, asking snake-handlers to take literally every passage in the Bible does not mitigate against taking the passage in Mark 16:17-18 literally. It is certainly not a Christian approach simply to counsel the snake-handlers to scoff at the passage or ignore this passage or suggest it does not belong in the Bible. The necessary approach is to find an alternate interpretation of this passage that fits within the broad Christian tradition of biblical interpretation, which does not always prefer literal interpretation. Better than literally writing the passage out of the Bible ought to be an attempt to make sense of the passage spiritually. The literal reading of the passage, frankly, is the most obvious reading of the verses, but it need not be the only way to read these verses. There are five “signs” listed in Mark 16:15-18. Out of these five “signs” many mainstream Christians would accept casting out demons (such as Catholics - at least through the formal rites of exorcism - and many evangelical Protestants), speaking in new tongues (charismatic Catholics, Pentecostals and other charismatic Christians), and healing the sick (Catholics, mainstream and evangelical Protestants). But it is only a very few who take seriously the other two “signs,” namely, picking up poisonous snakes and drinking poison. Why? Why do most Christians ignore these two signs? Some might argue that casting out demons, healing the sick and speaking in new tongues have a more substantial biblical basis. Jesus’ ministry is full of him casting out demons and healing the sick, as the first two chapters of Mark alone attest. The examples in the four Gospels are too numerous to mention. Speaking in tongues is also attested in Acts 2 and in 1 Corinthians 12-14. What does the rest of the NT say about drinking poison and snake-handling? After we had reached safety, we then learned that the island was called Malta. 2 The natives showed us unusual kindness. Since it had begun to rain and was cold, they kindled a fire and welcomed all of us around it. 3 Paul had gathered a bundle of brushwood and was putting it on the fire, when a viper, driven out by the heat, fastened itself on his hand. 4 When the natives saw the creature hanging from his hand, they said to one another, “This man must be a murderer; though he has escaped from the sea, justice has not allowed him to live.” 5 He, however, shook off the creature into the fire and suffered no harm. 6 They were expecting him to swell up or drop dead, but after they had waited a long time and saw that nothing unusual had happened to him, they changed their minds and began to say that he was a god. Paul does not die, indeed, he suffers no ill effects from the viper bite. This might have influenced the inclusion of the later passage found in Mark 16:15-18, it is impossible to say for certain, but it does indicate a tradition within the early Church of resistance to poison or venom due to one’s Christian faith (it can be assumed here in Acts that Paul’s resistance is due to his faith in Jesus Christ). Both the passage from Acts and that from Luke give us clues as to how to interpret the passage in Mark. Paul’s encounter with the viper in Acts 28 is not purposeful but unintentional. He does not seek out a snake, a snake seeks out Paul. Paul’s health is preserved, but he did not attempt to handle the snake himself, only shake it off. In Luke 10, Jesus announces this power over poisonous creatures, but states that the true power is over the forces of evil. But even that power is less significant than the salvation offered through Jesus. In these two passages, it does not seem to counsel direct handling of snakes, but God’s preservation in one case (Paul) and the power of God over the forces of evil, compared to snakes and scorpions, and the priority of spiritual salvation over the manifestation of signs (Luke). When we ask two questions of the biblical material - 1) what do snakes generally refer to in the Bible? And 2) what does poison generally refer to in the Bible? – we find that the passages from Acts and Luke fit with a general biblical view of snakes and poison as representative of spiritual evil and God’s protection over his people. There are, naturally, also passages where snakes are snakes and poison is poison. 14 And just as Moses lifted up the serpent in the wilderness, so must the Son of Man be lifted up, 15 that whoever believes in him may have eternal life. 16 For God so loved the world that he gave his only Son, so that everyone who believes in him may not perish but may have eternal life. I do not know any snake-handlers, I have not met any snake-handlers, but they seem to be devout Christians and one thing is clear: they believe by handling snakes they are performing God’s will and interpreting the Bible correctly. It seems like such a loss, though, to lose faithful people to the poison of snakes when it need not happen. And, after all, what kind of sign is it when snake-handling preachers die from a snake’s venom? What is the lesson the world is taught? They certainly learn that snake-handlers take their faith deadly seriously, which is to be commended, but also that faith is irrational. It is true that among the signs in Mark 16:17-18, casting out demons, speaking in new tongues and laying hands on the sick seem to be best interpreted literally, and are by many Christians, so why interpret “they will pick up snakes in their hands, and if they drink any deadly thing, it will not hurt them” symbolically? Poison and snakes in the Bible often represent literal snakes and poison, but it is more significant that snakes and poison represent spiritual death and evil. Snake venom will not hurt anyone ultimately, that is, in a spiritual sense, since Christians believe Christ has conquered the forces of sin and death, but that does not mean snakes and poison will not harm people physically. The true gift is eternal life, but we ought not to be treating the gift of our physical lives with disdain and tempting death.